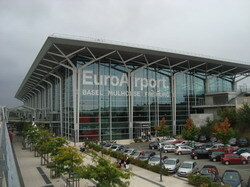 Basel Euroairport BSL is actually located on the territory of France, bordering Switzerland, it belongs to two countries at the same time. This is one of the best airports in the Upper Rhine, serving millions of tourists every year. A very good location of the airport deserves a special attention, which is equidistant from the three states. Thus, the answer to the question of how to get to the city, will depend on where you want to go - to France, Austria or Switzerland. If you are looking for a cheaper option than a taxi, you should pay attention to public transfer. For example, every 20 minutes a bus runs from the airport to the center Basel. Нou can get to the French town of Mulhouse, if you take a taxi, which moves with an interval of one hour. Also, once in every two hours, you have a chance to go to the German city of Freiburg. If you do not want to wait and don`t want to overpay for a taxi, the best way is to book a transfer service from the airport to Basel or any other city: fastly, easyly an an affordable price.